The University of Mississippi ICP-MS Facility has developed the following fee structure for sample preparation and analyses by ICP-MS or laser ablation ICP-MS. It was devised to cover basic operating costs such as consumables and service calls, and to provide salary support for facility staff. We aim to be flexible in our analytical capabilities, and welcome users of all levels of experience and needs. 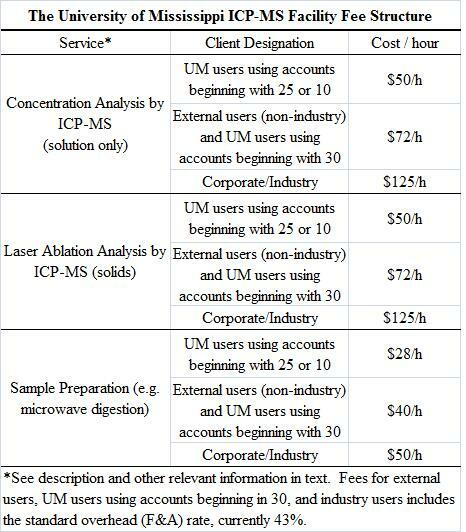 The fee schedule for UM users, external users, and industry is shown below. For scheduling and/or more information, contact: Dr. James Cizdziel Department of Chemistry and Biochemistry 333 Coulter Hall The University of Mississippi, MS 38677 Tel: 662-915-1814; cizdziel@olemiss.edu. Minimum ICP-MS use time is 5 hours: Generally it takes ~1 hr to warm-up and optimize the instrument, ~1 hr to prepare standards, enter information into the instrument software and setup the autosampler, ~2 hr for analyses of 1-10 samples including all standards and QA checks, and ~1 hr for data quality checks, data reduction and report generation. Each additional set of 10 samples adds about an hour to the analyses. For analyses requiring multiple standard solutions sets (some elements and acids are not compatible and thus may require standards with different acid matrix) an additional hour is added. Please contact facility staff for additional details and an estimate for your particular needs. Instrumentation: Unless a specific instrument is requested and agreed to ahead of time, facility staff will select the instrument to be used for the analysis, either ICP-QMS or ICP-SFMS. Concentration Analyses: All solutions must be filtered/free of particulates and organic compounds. All solutions should be in 1% to 5% HNO3. Sample solutions can be in dilute HCl but this must be disclosed prior to analyses. We require a minimum of 15 mL (preferably 50 mL) of solution for concentration analyses. Standardization of concentration analyses: If standards are not supplied, they can be made at MSCTER. If the concentration of the samples are not well constrained (within an order of magnitude), a quick analysis must be conducted to determine the concentration ranges needed for the standards. The time involved for these steps will be charged at the assisted rate. Laser Analyses: All mounts should be polished, free of coatings, and >50 microns thick. Laser ablation includes three spots on a sample plus an additional three spots on a standard(s). Unconventional samples can also be analyzed but they must fit into the ablation cell. Sample Preparation: The microwave digestion system is limited to 10 vessels, one of which is a blank and another of which is a reference material. Weighing the samples into the vessels, adding acids, setting the program, running the digestion, allowing time for samples to cool, and transferring and diluting the digestates, takes about 2 hours per 8 samples. If more throughput is desired a block digester which holds 48 samples is available but it is not recommended for volatile analytes. There is a three hour minimum charge for block digestion given the additional weighing and dilution, and the longer digestion times needed. Turn-around time: Generally one month or less. If there are special circumstances requiring faster analysis please discuss with facility staff.